Isn’t language fun and cool! As I was browsing through my photo album from this summer’s pictures, I came across a few pictures that got me thinking. I have written before about how my father-in-law and his siblings grew up in the mountains of West Virginia, but today I want to take the time to think about what it was like to celebrate the holidays during life there. 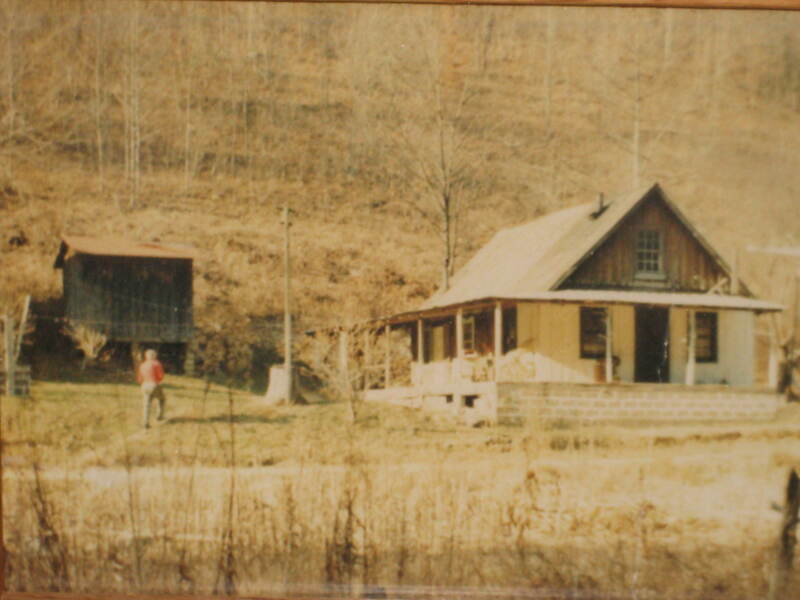 My FIL has told me stories about growing up in this little house. There were many children raised here. There were two bedrooms in the house- a boys’ bedroom and a girls’ bedroom. I imagine there wasn’t much privacy, but I am also sure there were many memories formed to be cherished over the years. I have been told about how their mother had to milk their cow every morning for fresh milk, as there was not a store in sight for many miles. There is no running water here. Before the well was dug, the boys were responsible for going to a spring nearby to collect buckets of drinking water. No running water also meant there was an outhouse. Some of the food was stored in a cellar that was built outside. I am sure that their mother and sisters were responsible for canning a lot of food from the garden. It takes us about an hour to drive our vehicle up the mountain, and that is in good weather. I can only imagine what it was like in the winter. I remember a story told to me about one of the brothers who acquired polio one winter. The ground was covered by snow, and the only way down to reach a hospital was by sled! Lo and behold, he did make it to the hospital and is with us today! This leads me to the holidays. My imagination creates an image very much like that of Little House on the Prairie. I see a small Christmas tree that had been cut down from somewhere on the mountain. This tree is standing in a small room that is lit up by the light from the fireplace. On Christmas Day I bet each of the children living in the house was very excited to surround the tree to see what treasure they may have been left by Santa. But, most of all, I am certain that they must have been left with wonderful family memories. When you are around my FIL’s family, you can feel the love between them even now. 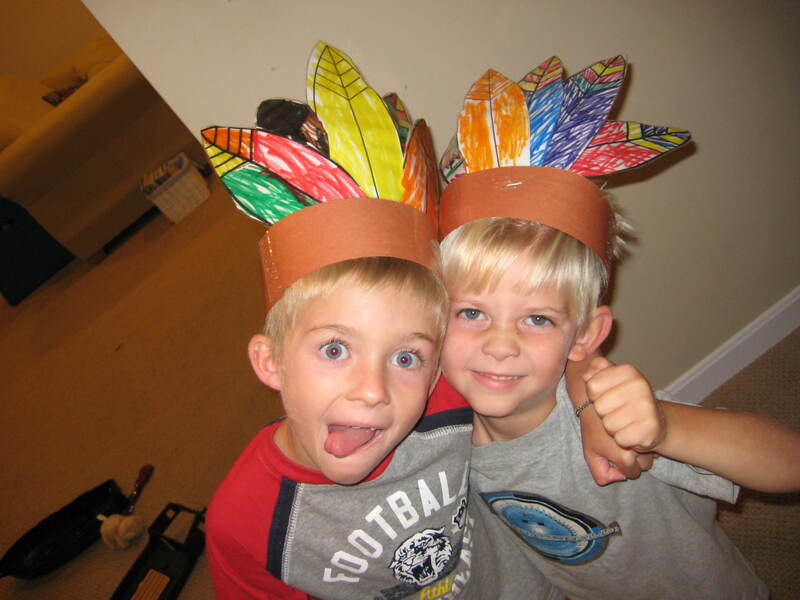 I am so thankful that my children are part of such a wonderful family heritage! 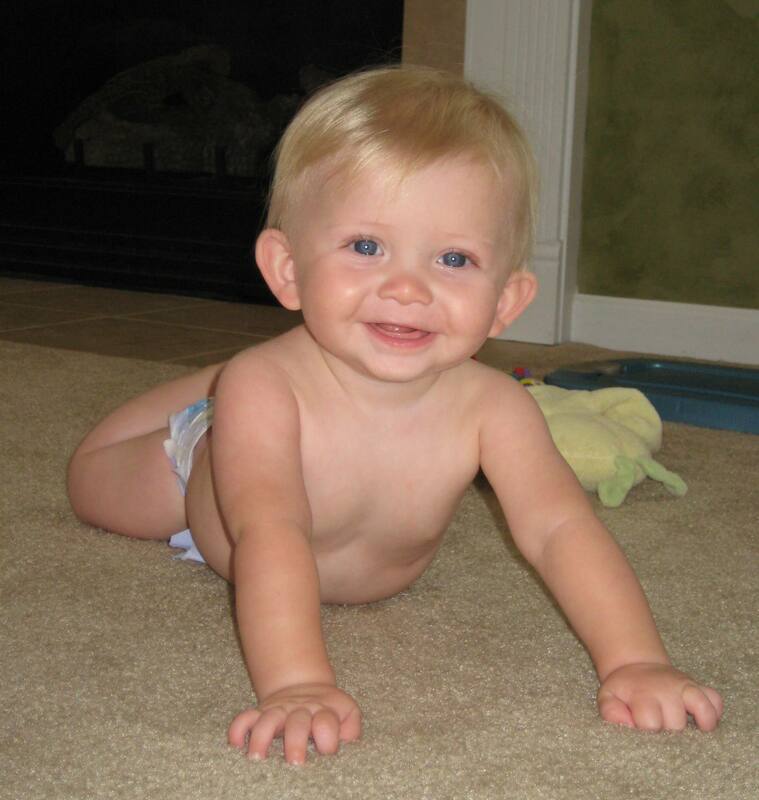 *12-2-09 Baby Ben is now home! A sincere thanks to ALL of you, from Baby Ben’s parents. God is good! I just recieved an email from Baby Ben’s mom! It sounds like he is doing great! Praise be to God! I just wanted to send you an update. Yesterday was a big day. I cannot name all the tubes and things that they took out of him. He was taken off the ventalator pretty early and did great. It is amazing that the little guy is not in pain. They are only giving him a sort of liquid ibuprophen. They let him start eating again in the afternoon and has done an awesome job at that too. In fact he is now doing so well they are transferring him today to the step down unit! That means we are only a few days away from coming home with him. I cannot believe the last 5 days have even happened, but it is amazing to see how good God is. He had heart surgery less than 2 days ago and is now being transfered out of the ICU! Thank you ALL for the prayers! You will never know what it means to Baby Ben’s family. I will keep updating as Baby Ben progresses. I hope to have a new picture to post soon. I just got a message from my friend, Baby Ben’s mom. She said that the nurse had just came out and told them that they fixed the coarctation. He is doing very well and they were about to close soon. She wasn’t sure if they will be able to take out the breathing tube just yet, but the nurse seemed hopeful. He still has a moderate sized hole, but we are praying that that will close on it’s own so he will not need another surgery. I just recieved an email from my friend. She said that Baby Ben will go in for surgery at 11:00 this morning. The surgery is expected to take a minimum of three hours. Please say a prayer for Ben. Ask God to give him strength to make it through the surgery with no complications, to give the surgeon clarity while performing the surgery, and to help Baby Ben with a great recovery! A very good friend of mine just delivered a baby boy this past Tuesday. Her delivery went well, and everything was great with the baby at first. Yesterday, however, things went down hill very fast! He apparently has a condition called coarctation of the aorta. 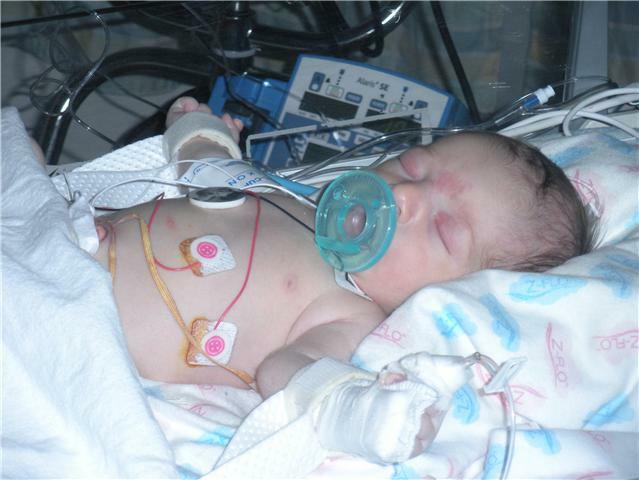 This means that his aorta didn’t close completely before or after he was born. They are hoping that he will be able to have surgery tomorrow. Please keep Baby Ben and his family in your prayers! Ask God to be with them through this difficult time and to help Baby Ben get through this surgery with no complications. 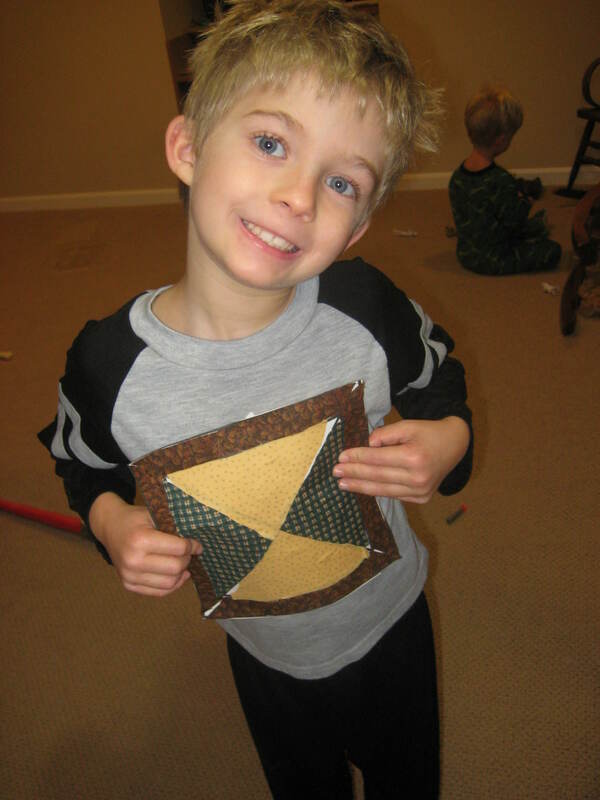 Little R made a "quilt" during a Veritas Phonics Museum lesson. With all the craze surrounding the Twilight Series, I couldn’t help but think- VAMPIRE! Okay, no teeth in this picture. But, I thought it was cute anyway! Baby J has been laying these wonderful sloppy kisses on me that only a baby can do, but this morning….. HE BIT ME! Now, I have this awful spot on my bottom lip that is missing a piece of skin, and it hurts! Of course, he didn’t mean it. He bites e-v-e-r-y-t-h-i-n-g these days. I guess it comes with the territory of teething. Do you have a child that has a problem getting their letters ‘d’ and ‘b’ mixed up? Well, I sure do… At least up until now! I realize that there are probably countless tricks already out there to help teach this problem, but I don’t always have time to go searching. So, sometimes I wing it- so to speak. Our field trip to Shaw Farm during the Pumpkin Festival. So far, I am enjoying homeschooling tremendously! I am not trying to imply that we don’t have challenges, or even bad days, but overall- I love it! There is something about being with my children on a daily basis that gives me a kind of fulfillment that I didn’t know exsisted. I believe that the homeschooling part plays a HUGE role in this aspect. When homeschooling, we are forced to be with our children one on one instead of finding something to “occupy” them while we get on with our own jobs, so to speak. I have to add, too, that having the privelage of witnessing my children grasp new ideas and concepts is something I cannot put into words! Many times while watching them, I have felt the kind of joy in my heart that brings tears to my eyes. If you are a homeschooler, you probably know what I am describing. I thank God everyday for this blessing that he has bestowed upon us! 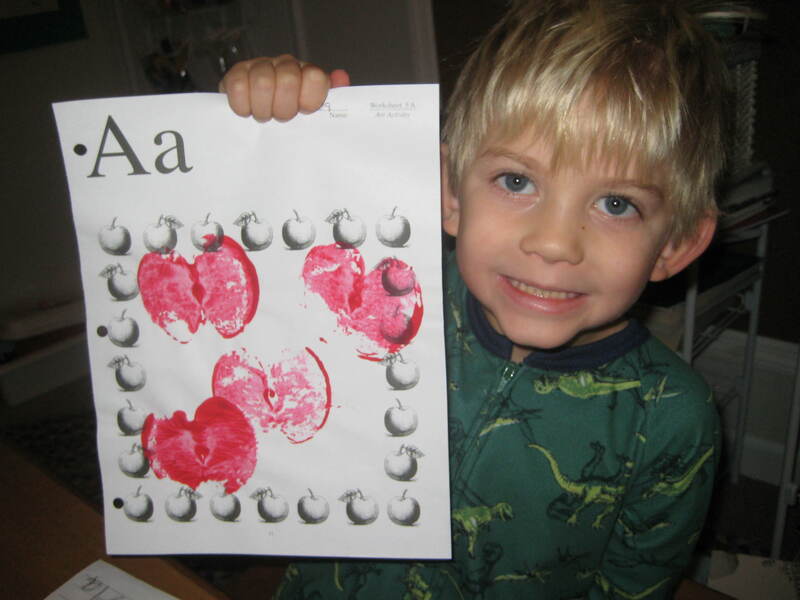 An art activity from the Veritas Phonics Museum. I have waited a long time to finally get the chance to visit The Creation Museum of Petersburg, Ky. A good friend of mine invited me and my boys to join her and her homeschool co-op on homeschool day. I believe The Creation Museum offers homeschool days on every Wednesday and Thursday as long as you order in advance. You can find out more information about this on their website. I had heard and read a lot of great things about The Creation Museum in Petersburg, KY since it was first built, and all of what I learned built the place up in my mind to be something extraordinary. I have to say that I was not let down in the least! Every single display was done to complete perfection. There is an unbelievable amount of quoted scripture that supports every thing that is stated. It is like walking through the Bible and seeing it come alive! The first thing we did when we arrived was to encounter the Stargazer’s Planetarium. This experience alone, along with all the oral documentation, is an absolutely unbelievable experience! It explains the enormity and magnificence of outer space in such an incredible way, that it paints a miraculous picture of God’s true existence. The main focus of the museum is on creation, but there are some things on display that represent other issues. Some of what I can remember pertains to times of now, but since I had my children with me on this trip I did not get the chance to absorb all of it. My children liked the outside petting zoo the best. 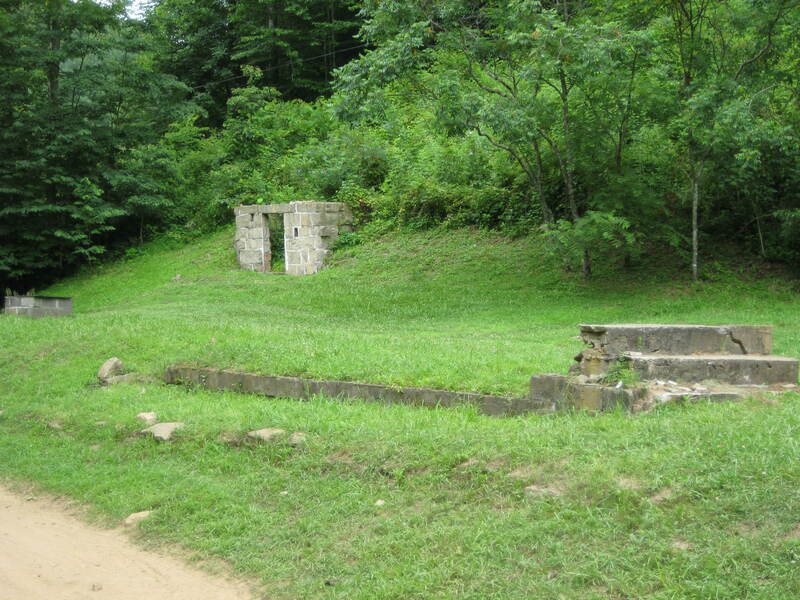 It is located at the end of a beautiful walking path outside. There are a few animals that can be pet and fed. I was impressed how knowledgable the animal caretakers were of the animals. They were able to answer all of our questions. For the Christmas season, there will be a beautiful Nativity display outside in the front of the museum that I believe is free of charge. We saw people working on building the display when we were there. I thought this would be a good place to mention, too, that I read an article in the Home School Enrichment magazine about how a large amount of work done at the museum is by homeschooled children and previously homeschooled graduates. I absolutely cannot wait to go back, though the next time I would like to go sans kids. There is a lot to read and watch, and with little kids in tow it is very hard to accomplish. Lucky for me, I only live about 1/2 an hour away, so this is very possible. After returning home from vacation, we spent a good solid week on school- which is going great, by the way! (I will have to make a post all about school later…) Then, we had a week of school and field trips. It almost felt like a mini-vacation in itself…lol! Our first field trip was to the Wright-Patterson Airforce Museum. It was a really fun experience. The boys were amazed at all of the airplanes the museum owned and displayed. It was very neat to see how the airplanes changed in design over the years. I thought the museum did a great job of creating displays centered around different eras, such as the world wars, Vietnam, and even the Cold War. One of the most touching display for me was a small one about the Holocaust. I have always found that topic very intriguing, but emotionally appalling. There were also displays that included information about what it is like to be involved in wars now, like Afghanistan and Iraq. I truly felt serious emotion while I was looking at all the planes and reading the various pieces of information. There were even many videos that showed different people being interviewed about their experiences first hand during these rough times. Little R out in space! My boys especially liked the space displays. There was an astronaut’s suit that you could stand in behind for pictures. There was also a simulation booth that gave you an example of what it would be like to blast off into space! And, there was a whole room displaying rockets! Little C out in space! In the hands-on room, we were lucky to have met a volunteer who really had a passion for his job. He taught me some things, as well as my boys. I wish I would have thought to get his name. It is rare to meet people in the world today who are so wonderfully helpful. There is a display of some of the Presidential Planes, but were did not get to see those this time. We will be sure to plan for that on our next trip. We can’t wait to go back! Would you believe me if I told you this was all FREE! If you have the opportunity to visit the Wright-Patterson Airforce Museum in Dayton, OH, it is a must! *I would have added more pictures, but it was a bit dark in the museum so they did not turn out well. I guess the saying is true: “Time flies when you are having fun.” The month of October proved to be just that- fun! We were very blessed to be able to start the month off with a wonderful vacation to Florida with my mother-in-law and father-in-law. We stayed in a private condo that was just wonderful! Not only was it clean and decorated very invitingly, but it had a real kitchen! You might not understand why, on a vacation, I am excited to have a kitchen. Having a child with severe food allergies greatly limits us as to where we can eat out. We virtually NEVER eat out! I have to add, also, that having a wonderful mother-in-law along who cooks wonderful meals was just the icing on the cake to made our stay even that much better. Little C, Baby J, and Little R.
… I wanna go back! Here are just a few pics from our trip. I had to do a rush add job for the grandparents at home, so I will add more and edit later. Baby J's first time in the sand. Little C wave jumping..... he says, anway...lol! William Davis. My uncle and Godfather. Uncle Willie lost his battle with lung cancer in late September. Though he looked wild on the outside, this was a man who loved Jesus with his whole heart. He took the time to tell everyone about Jesus. People who didn’t really know him probably thought he was crazy, but those of us who knew him well knew a man who would do anything for anybody. We love you Uncle Willie, and we will never forget you! Learning letter 'I' while using The Veritas Phonics Museum. 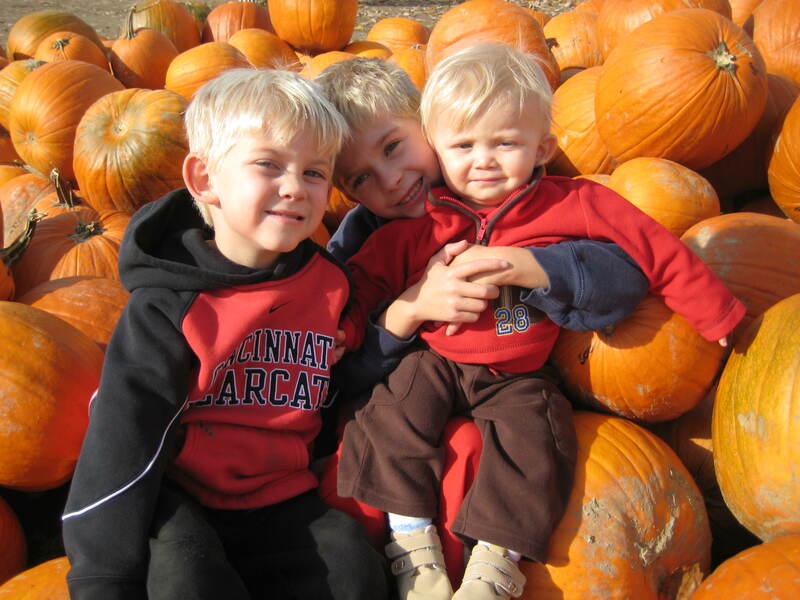 On Friday, September 11, 2009 the Cincinnati Nature Center has plans for a fun-filled evening for families. The evening will start with a picnic brought from home and ice cream provided by United Dairy Farmers. There will also be blue grass music for listening enjoyment. The main part of the evening will be strolling through trails that will offer various learning stations, and the finale is a cabin re-enactment with the Queen City Harmonica Club. It doesn’t matter if you are a member or non-member, and you DO NOT have to pre-register. You can visit the CNC’s site here for more details. Please Don’t Pass the Nuts!